To judge the benefits of a web cleaning system in your specific process, a little knowledge of the problem can be helpful. 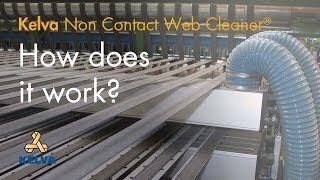 Contamination of a moving web can be caused by the environment, the process itself or needed operations. Debris, such as particles, fibres and even foreign objects can influence quality, customer satisfaction and health and safety. From the smallest particles that interfere with clean room environments to larger fibres that cause quality issues such as poor printing quality or even rejects, web contamination is not an easy to solve problem. Physical phenomenon’s, such as electrostatic charging and boundary layers do make the solution even more challenging. Every moving web will charge, the less conductive the substrate is, the stronger the charge can be. Even moist and temperature do influence the level of charging. As a charged web tries to keep the contamination stick to its surface, a neutralisation of this static load is inevitable for a good result. Kelva offers several solutions for discharging the web, from a simple carbon fibre rail that grounds the web on a small label cleaner to high-efficient active dischargers integrated in our Cleanflow® solutions. Depending on the material the substrate is made of and web speed, a layer of air is dragged along by the moving web. The thickness of this layer can interfere with the need to remove debris, as the particles and fibres are caught in this layer, transporting the debris along your operations. When an effective web cleaning device is used it has to open the boundary layer. But, only a barrier alongside the substrate, even with a vacuum slot, does cause additional problems: as soon as the layer is suddenly broken by this obstacle, the turbulent air mass spreads the debris into the surrounding air. The particles – yet out of any control – will come back into your process. If this happens after the web cleaner, the problem is back into its original form. The Kelva solution opens the boundary layer by limiting its thickness mechanically and turning it into turbulent air. As soon as the web enters the cleaner this layer is absorbed by the cleaner together with the contaminations. Depending on the material cleaned, Kelva offers special solutions that contain mechanical barriers inside the cleaning process, breaking the boundary layer completely but inside the cleaner and thus catching the launched particles. Kelva provides a wide variety of made-to-measure web cleaning solutions – contact as well as non contact. We offer you the benefit of using our know-how gathered in over 30 years experience in web cleaning, building over 6.000 installations world-wide. We invite you to take a look at our projects in various industries. We will be glad to answer your questions. Let your web contamination problem be solved by the inventors of web cleaning. You don't need to become a web cleaning expert to benefit from the advantages of web cleaning. Have your solution composed by the inventors of web cleaning!